Finding that “Perfect Present” can be easier than you think! The Eagle’s Nest Barn features the Stadium Room [for the TRUE BLUE U of M Fan] AND the Jackson County Room showcasing the many fine art photographs of the local area. The upper levels of the barn feature photographs and posters of Ann Arbor and the U of M Hospital. Also, we are opening up the top level which has many mounted, matted, framed and unframed fine art photographs and posters of Detroit, Tiger Stadium; New York, the Statue of Liberty, and the Twin Towers. 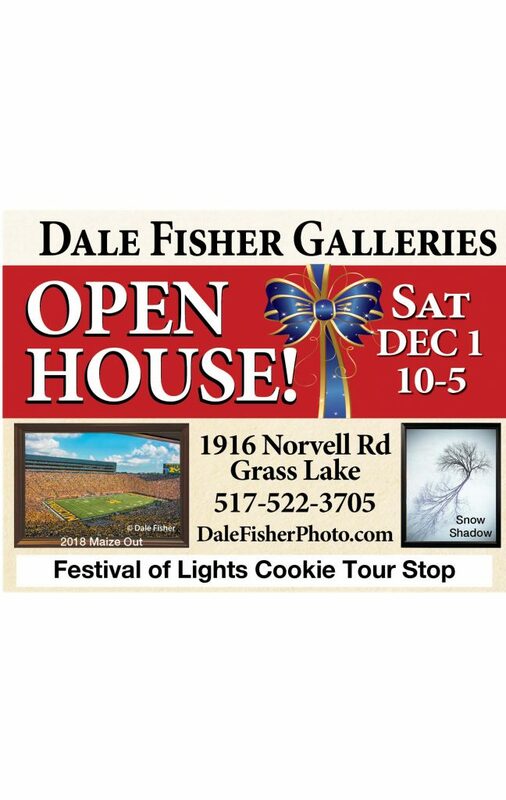 The Wings Gallery displays Dale’s more current work and is also one of the Festival of Lights Country Christmas Cookie Tour Destinations. Sponsored by the Grass Lake Chamber, the festival of lights has many family friendly events throughout the day. Starting with Breakfast with Santa, then The cookie tour, a great family tradition, begins at the Whistle Stop and runs from 10am-1pm. Other activities include lunch with Santa, Christmas Movies at the Lost Railway Museum and then the Festival of Lights parade begins at 6:30 with the lighting of the Christmas tree after the parade. The entire schedule is on the Festival of Lights facebook page. We’ll have the Galleries open from 10 am – 5pm, however, if you can’t attend our Open House, please call to schedule a time that is more convenient. Wishing You a Blessed & Happy Holiday Season!